Why do I care? The structure of the atmosphere dictates the way the atmosphere behaves and controls how weather develops near the surface of the earth. The atmosphere consists of 4 layers: the troposphere, stratosphere, mesosphere, and thermosphere. Figure A shows the placement of the different layers of the atmosphere and how the temperature changes with height as you go from the ground up to space. The troposphere is the lowest layer of the atmosphere. This is the layer where we live and where weather happens. Temperature in this layer generally decreases with height. The boundary between the stratosphere and the troposphere is called the tropopause. The jet stream sits at this level and it marks the highest point that weather can occur. The height of the troposphere varies with location, being higher over warmer areas and lower over colder areas. Above the tropopause lies the stratosphere. In this layer the temperature increases with height. This is because the stratosphere houses the ozone layer. The ozone layer is warm because it absorbs ultraviolet (UV) rays from the sun. The mesosphere is the layer above the stratosphere. The temperature decreases with height here just like it does in the troposphere. This layer also contains ratios of nitrogen and oxygen similar to the troposphere, except the concentrations are 1000 times less and there is little water vapor there, so the air is too thin for weather to occur. The thermosphere is the uppermost layer of the atmosphere. In this layer the temperature increases with height because it is being directly heated by the sun. Why Do Temperature and Pressure Decrease with Height? The molecules that make up the atmosphere are pulled close to the earth's surface by gravity. This causes the atmosphere to be concentrated at the Earth's surface and thin rapidly with height. Air pressure is a measure of the weight of the molecules above you. As you move up in the atmosphere there are fewer molecules above you, so the air pressure is lower. Figure B shows how pressure decreases with height. The black dotted lines show how much of the atmosphere is below you at a certain level. For example, at 10 miles up, 90% of the atmosphere is below you. 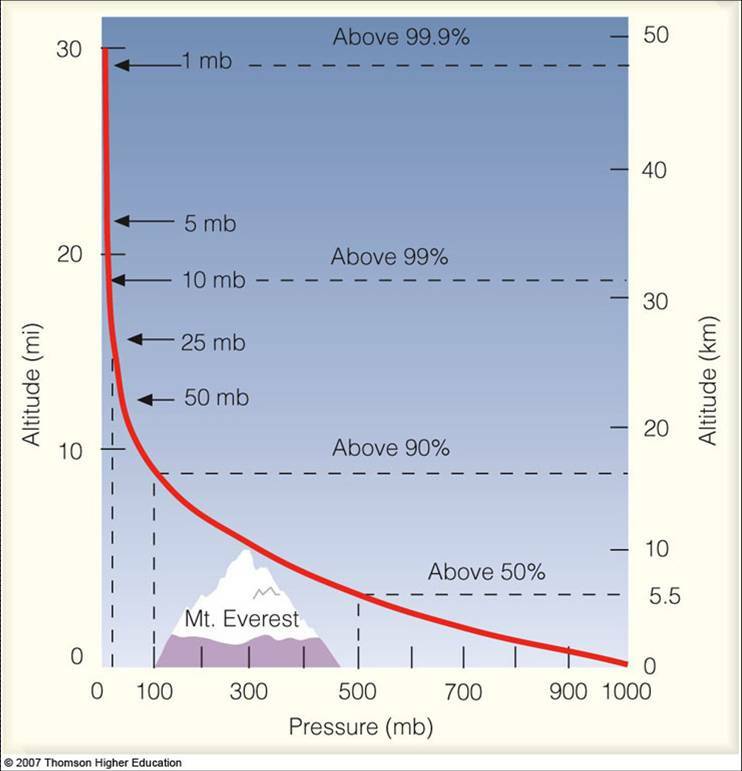 At the peak of Mount Everest, as shown, the air pressure is 70% lower than it is at sea level. This means when mountain climbers breathe air on top of the mountain, they are only inhaling 30% of the oxygen they would get at sea level. It is no surprise that most climbers use oxygen tanks when they climb Mt. Everest. Temperature decreases with height in the troposphere. This is true for a couple different reasons. First, even though the sun's energy comes down from the sky, it is mostly absorbed by the ground. The ground is constantly releasing this energy, as heat in infrared light, so the troposphere is actually heated from the ground up, causing it to be warmer near the surface and cooler higher up. Another reason is the decreasing air pressure with height. If the warm air at the surface gets blown upward into the cooler air above it, the surface air will continue to rise. As air rises into areas of lower pressure it expands because there are less molecules around it to compress it. The molecules in the air use some of their energy to move apart from each other, causing the air temperature to decrease. The constantly decreasing air pressure in conjunction with the ground-up heating keeps the temperature in the troposphere decreasing with height. In the real atmosphere, the actual vertical temperature structure depends on air masses with specific properties of temperature and humidity being blown into the area as well as effects of daytime heating. If you have a layer of air with warm temperatures above the surface, we call that an "inversion". That layer can act as a cap which prevents clouds and sometimes severe weather from forming. 7th grade science: 7.E.1.1 : Compare the composition, properties and structure of Earth's atmosphere to include mixture of gases and differences in temperature and pressure within layers. Earth Science: EEn.2.5.1 : Summarize the structure and composition of our atmosphere.